Shuhei Hosokawa's article, "The Walkman Effect," poses that the cassette recorder for headphone listening and its more contemporary cousins represent an important evolution in the practice of urban life. Supporting the claim that the Walkman illustrates a larger trend in which society is marked by "an intersection of singularities in the construction of discourses" (1984, p. 165, emphasis in original) Hosokawa weaves together a complicated mix of music theory, continental media studies, and postmodern thought. In this note, I want to provide an overview of this article's most basic ideas focusing on Hosokawa's discussion of musica mobilis, the technology of the walking gadget, the relationship of the Walkman on urban life, and the notion of secret theatre. Hosokawa first outlines a brief history of musica mobilis, "music whose source voluntarily or involuntarily moves from one point to another, coordinated by the corporal transportation of the source owner(s)" (1984, p. 166). This history includes the emergence of urban life itself with its ever present blurring of music and noise. Into this scene we then find street musicians who blur the distinction between music/noise producer and consumer. Technology provides the third moment in this history, the introduction of portable instruments and music producers that allow strangers to listen to music together, but only for moments. The walkman adds a final moment to this history in which the "listener seems to cut the auditory contact with the outer world where he really lives: seeking the perfection of his 'individual' zone of listening" (1984, p. 167). The question that so-called cultural moralists may ask: does the technology of the Walkman with its potential proliferation of secondary functions (video game, calculator, and alarm clock) create an alienated self in a lonely crowd, or does this technology change the relationship of self and society in a more fruitful way? Addressing this question, Hosokawa describes the Walkman as an example of technological regression, an instrument noted by its reduced number of features in a world of objects that seem to gather functions endlessly. This singular walking object is notable by its technology of miniaturisation, singularisation, autonomy, and constructed/deconstructed meanings. In turn, miniaturisation refers to technology's ability to reduce the space necessary for its use and, consequently, increase the potential for individual action beyond the private sphere. Singularisation extends this process by removing the need for individuals to experience technology in some social context; we can experience recorded music without concern for space for society. Autonomy fills this nomadic experience with its own context, its own reality. Hosokawa illustrates this notion by a cinematic example of two lovers listening to music on individual headphones, ignoring the music heard by others around them. 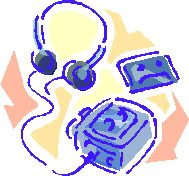 The resulting construction and deconstruction of meaning allows Walkman-using persons to re-read the "text" or urban life, reforming it through their use of distancing technology. The relationship of the Walkman to urban life constitutes the heart of Hosokawa's essay. Here, the author describes this scene as never-fixed but, rather, one that emerges with the motions of those who inhabit it. This notion of urbanity challenges the perspective of would-be planners of public life: "The urbanist can only prepare this blank text to be read, though he sometimes fancies that he provides the integral text of a city and that the inhabitants should live almost wholly under the normative rules he has presupposed" (1984, p. 173). Extending from this argument, Hosokawa rejects the idea that our sonic landscape may be considered homogenous. Rather, the act of walking creates an evolving and mutating environment that gathers, solidifies, and diffuses itself according to the technology and agency of the individual. Unlike other technologies of sound that subtract from one's potential actions - consider how many ways you can interact with a concert pianist - the Walkman both distances us from the landscape and allows us to freely alter it. What then of our relationships with other people? Hosokawa concludes this essay with a discussion of Walkman as secret theatre in which the user listens "not only to something secret but also to the secret itself, a secret in the form of mobile sound: an open, public secret" (1984, p. 177). Unlike the personal worlds we carry with us, even the personal visions of urbanity that draw from the same scenery but rarely interact, the Walkman creates a theatre of interaction at a new level. Rather than knowing the scripts that we read, the music to which we listen, society emerges from our shared awareness that we possess a secret. Instead of alienating us from one another: "people communicate with one another through the form - not the content - of the secret" (1984, p. 178). That's a bold claim! As you review this essay, consider whether Hosokawa convinces you that the intersection of nomadic Walk-people constitutes a shared experience. Doing so, consider the recent emergence of the Palm Pilot in public life. How does this new technology extend from and challenge Hosokawa's thesis?